IBI Ltd provide a wide range of belting services including those listed below. There are various methods of joining a conveyor belt dependent on requirements. 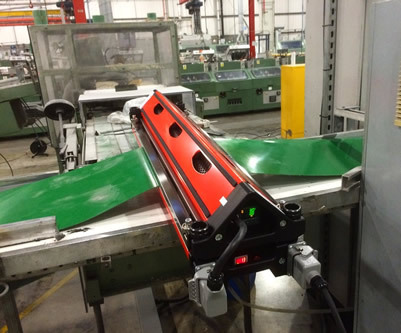 Each of our engineers have been fully trained to the highest standards of conveyor vulcanisation, whether it be hot, cold, mechanical, step, bias or finger splicing on site or in house. When required we can supply our own belt reeler to safely and efficiently install a new belt or roll up old belts. Offering a 24/7 service, we can respond quickly from our nearest depot carrying water cooled presses with our own power supplies. Where applicable, cold joints with glues and mechanical fasteners are also available. Lagging allows the belt to run smoother as it eliminates any kind of slippage and can be relied upon when adverse weather conditions persist such as heavy rain or snow. We offer in house or on-site lagging of your drive or snub drums to eliminate material build up using mini and large diamond patterned lagging. These are available in 8mm or 10mm thickness with a range of shore hardness. 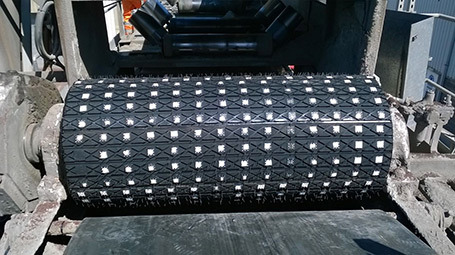 For more arduous conditions where conventional rubber lagging does not work, ceramic or grit lagging can be applied. When a mechanical joint is required IBI will supply an on-site clipping service or provide all tools and clips for the work to be carried out. A pre-clipped endless belt allows you, the customer, to fit and join the belt yourself therefore reducing the down time when the belt needs to be replaced. Chutes and hoppers can be lined in rubber and polyurethane with installation of rubber by cold bonding or bolting of polyurethane. This reduces build up and blockages. Lining in 40 degree Shore hard rubber is designed mainly for sliding and small particle sizes proving excellent high wear against fine grained slurry materials. Lining in 60 degree Shore hard rubber is designed to resist the high level of wear and tear when material is of large particle size with high tensile strength and tear resistance. Both types can be supplied in various thicknesses dependent on application. Polyurethane sheeting provides good resistance to fine and medium particles and is excellent at resisting oils with very good ozone resistance. Various hardness and thicknesses are supplied dependent on application. All PVC and PU belts can be vulcanised on site by our engineers. Belts are vulcanised with our high speed air cooled presses up to widths of 3200mm.